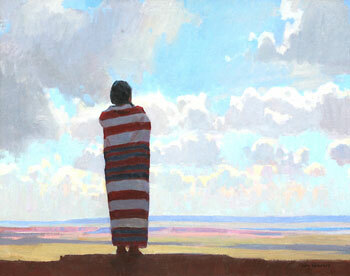 Ray Roberts, Monument Valley, Oil on Board, 25" x 30"
Ray Roberts is squinting as he stands near his portable easel on a sun-drenched November morning. He's eyeing the light as it illuminates the Glenmore Plaza Hotel, a lemon-yellow Victorian structure situated near the center of picturesque Catalina Island, just off the coast of California. Roberts is a guest artist at the annual Plein Air Painters of America show and sale. He's one of 30 artists who are visiting here for a week to paint scenes ranging from the bustling Avalon harbor to the rugged island interior where buffalo roam. On this day, Roberts is painting one of his last works for the weekend's grand finale-a show opening the following night at the historic Casino building. Ray Roberts, Joe's Horse, Oil on Board, 12" x 16"
The plein-air event draws painters from across the country, but Roberts is a native California son. Born in Santa Monica, he grew up in Tustin near Laguna Beach. "I remember a time when Southern California used to resemble Catalina's Shark Harbor," he says, referring to the island's remote, unspoiled harbor. As a boy, Roberts says, he played in the undeveloped hills and canyons near his home. "That was before freeways and sprawling residential development," he says. "It was a time before everyone put up fences and walls." Today, more than three decades later, Roberts is fond of capturing what remains of the magnificent, vanishing landscapes across the Golden State. And at 47, he is gaining increasing recognition for his efforts, winning a string of awards at various competitions around the country. Ray Roberts, Matriarck, Oil on Canvas, 20" x 24"
As a member of the California Art Club, Roberts is currently featured in a show called Scenes of the Pacific at the club's gallery in San Marino. It includes works by 10 painters who offer interpretations of California's coastline and ocean. Each artist focuses on a particular aspect of the area where the sky meets the sea; Roberts' paintings portray the various ways the bright light from the setting sun plays on dark waters. "I like to capture the last bit of sun as it casts shadows-the fleeting light on the water," he says. Sunset Pacific is a good example. Roberts finds a continuing source of inspiration in Southern California's golden light-the same light that attracted his painterly predecessors Hanson Puthuff and William Wendt to the area. Both Puthuff and Wendt were founding members of the California Art Club, which was established in 1909. While Roberts continues to admire such early Southern California impressionists, he also looks to painters like William Ritschel for inspiration. Ritschel was a German artist who settled in Carmel, CA, in 1911 and became known for his seascapes. "I'm trying to achieve that same luminosity that Puthuff, Ritschel, and Dixon accomplished," he says. 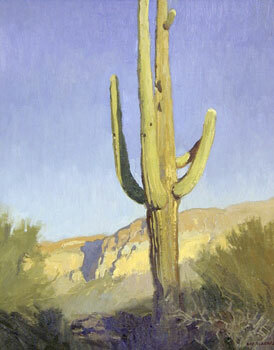 Ray Roberts, Saguaro, Oil on Board, 20" x 16"
Roberts has left California twice, living for a time in Arizona, but ultimately he returned home. "I missed the golden light in California. It's one of the reasons I keep coming back here," he says. "Coastal mountains trap in the moisture from the ocean and the result is a glow, a beautiful golden light that is unique to the area." These days he lives with his wife, painter Peggi Kroll Roberts, and their three children in the foothills of the Sierras, about an hour from Yosemite National Park. The landscape surrounding his home is sprinkled with grand oak trees and rolling hills, both of which he frequently paints. Roberts also frequents the nearby high desert area on the eastern slope of the Sierras during his plein-air painting forays. "There's lots of rocks, sage, and beat-up aspen trees," he says. "It's dry, windy, and desolate, and they shoot a lot of alien planet scenes for the movies there." 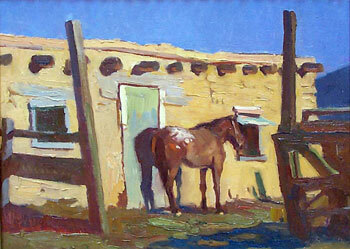 Ray Roberts, Mesa Solitude, Oil on Canvas, 24" x 30"
It was during his Arizona years that Roberts developed his affection for scrubby desert terrain. "The bright, harsh light on the desert creates striking graphic shapes," he says. 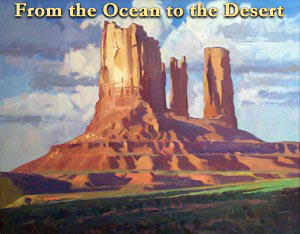 "It's what Maynard Dixon captured." While Roberts is comfortably ensconced in his painting career today, he explains that things haven't always been this way. After graduating from the Art Center College of Design in Pasadena, CA, he worked as an illustrator for 15 years. Although he was unhappy with his career choice, he lacked the confidence to pursue his dream-a riskier career in fine art. "I was an artist in denial," Roberts says half-jokingly. "I thought illustration was a more responsible way to be an adult, but then slowly I began to see fine artists like Clyde Aspevig and Kevin Macpherson being willing to take the risk and succeeding." 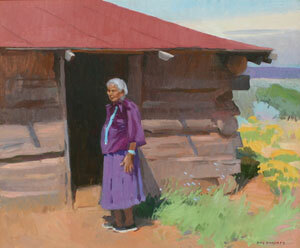 He began painting in earnest in his spare time as well as taking classes from Len Chmiel and Mark Daily. By 1992 Roberts was selling enough of his own works to feel comfortable leaving his illustration career behind. He has no regrets. As for the future, Roberts explains that his mission is to continue to grow as an artist. "I'm on an unfolding path, and I want to let myself evolve into a more honest and intuitive artist," Roberts says. "My goal is to reveal more of myself. Hopefully that will be evident in my art."